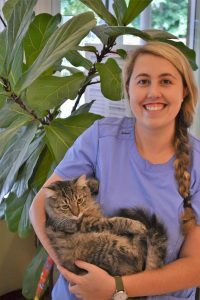 Time Spent in the Veterinary Field: 6 months at Lawndale, and previous experience working as an aquarist at the Greensboro Science Center caring for aquatic life such as sharks, stingrays, and Mantis Shrimp. What Her Teammates Say: Hannah is very considerate and shows empathy to all of our patients. 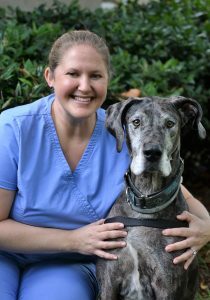 Her friendliness and compassion are evident to our patients and our pet owners. Engaged, dependable and incredibly helpful, it’s ‘All hands on deck’ when Hannah is around! She is a real team player, consistently anticipating the needs of those around her and doing all she can to get things accomplished. Hannah takes her job very seriously while still finding ways to have fun throughout the day. She is a strong advocate for the earth and environment and she is involved with educating the public and students in ecology and STEM. She loves ocean animals! She’s also from Britain so she has an awesome accent:) Hannah is a true pleasure to be around! Hobbies: Hanging with her family and boyfriend, traveling around the world, and trying out the new breweries in town. What Her Teammates Say: Arion has been motivated and passionate about learning her new role as a receptionist. Her customer service skills are excellent and she tackles her responsibilities quickly. She is extraordinarily patient and kind. She takes feedback well while being a quick and enthusiastic learner. Fun to be around, she is cheerful and friendly towards everyone and she is very easy to talk with. She has such a gentle demeanor with both pets and owners, and she handles difficult situations with grace. We love how she loves her dogs as if they were her children! Arion is very creative, and she will be taking on the role of creating our monthly staff birthday boards as well as coming up with motivational Monday quotes. Arion is all around a great addition to our team! Pets: Currently Tanisha does not have any pets, but she is looking forward to when she will be able to have a dog! What Her Teammates Say: Tanisha’s love and compassion for animals is clearly evident to all. She is gentle and intuitive when handling and working with the animals. When she has an extra moment, you can find her giving the boarders some extra attention. She is kind to everyone and always has a positive attitude and smile on her face. In fact, Tanisha never seems to complain or have a bad day! Dependable, eager to learn, trustworthy, and willing to take on any task requested with enthusiasm, Tanisha truly has an incredible work ethic. Tanisha is a fantastic team player, and her fun personality makes Lawndale shine even brighter! Favorite Thing About Lawndale: Getting medical care for her Great Danes who are constantly trying to drain her money supply! What Her Teammates Say: Carmen is that spark of “pawsitivity” and fun that every workplace needs and loves to have! She is always upbeat, cheerful, enthusiastic, and encouraging. Carmen is a self-starter who works hard while also finding ways to include others and get everyone involved. She is dependable, extremely talented, a fast learner, and she excels in training, client education, and customer service. She especially loves discussing animal behavior! Her patience seems to know no bounds. Carmen organizes many of the regular activities that help keep clinic team morale high. She is also a major (awesome!) contributor to Lawndale’s social media posts. She is truly a team player, and it is so clear that Carmen really cares for and loves the animals as if they were her own! 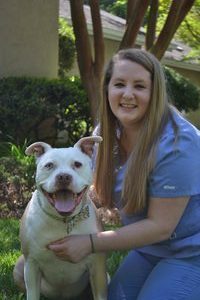 Favorite Thing About Lawndale: Ashley says that Lawndale treats the staff like family, from the head of the hospital to the very last pet tail! What Her Teammates Say: Ashley is all around amazing, loyal, generous, thoughtful, and she always gets the job done. Ashley has a creative gift that keeps the work environment fun – her birthday bulletin boards for the staff are always a hit, and she comes up with the best gift ideas! She always shines with her customer service skills. Not only does she remember individual clients and pets and why they are here, but also her demeanor is patient, kind, and helpful. Ashley does a lot of behind-the-scenes work that helps keep the hospital running smoothly. Ashley is a wonderful part of the Lawndale team – we all appreciate how much she contributes to the Lawndale family! Hobbies: Ashley loves spending time with her fiancé, their two beautiful nieces, and their families. She also enjoys trips to the beach and mountains, and staying busy with crafts and adventures – all while planning a wedding! Favorite Thing About Lawndale: Her team of coworkers – Samantha says everyone is very encouraging, patient and kind! Educational Experience: Samantha has an Associates Degree in Applied Science – Zoological Science Technology. She has completed several internships at a few different zoos working with many different exotic species such as Gorillas, Baboons, snakes, and North American River Otters, to name a few. She also worked as a temporary relief keeper at the Greensboro Science Center working with Javan Gibbons, Fossa, Howler Monkeys and more! What Her Teammates Say: Samantha is hard-working, reliable, determined, funny, always cheerful and smiling, and “ON IT”. She is a team player and she is great at encouraging everyone around her. Samantha is a very quick learner, and she always makes herself available to help with anything needed. Although she has not been with Lawndale for long, she has already made a very positive impact in so many ways. Her technical skills are top notch, and she has really done her homework so that her knowledge of the field is deep as well. She’s truly an awesome addition to our team – and with her positive and enthusiastic attitude, she gets along with everyone! 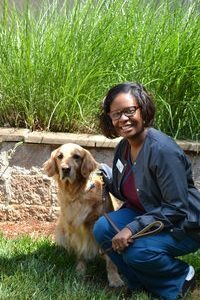 Hobbies: Volunteering at the Greensboro Science Center; Spending as much time as she can with her dog; Relaxing by the pool in the summer months. Favorite Thing About Lawndale: Dogs – especially big dogs! What His Teammates Say: Coty is “pure awesome” and an all around great guy! He is an incredibly hard worker. 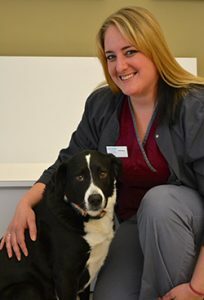 Clients and patients love him, and he is particularly amazing with big dogs and nervous dogs. He reads them well and takes on a calm, soothing demeanor that helps put the nervous dogs at ease. He is gentle, easy-going, dependable, and always willing to help out wherever needed (in fact, he’s always one of the first to jump in!). Coty is also our “Mr. Fix-It”! It is clear to everyone that Coty truly loves animals, and we are thankful to have such an asset to our team! Hobbies: Spending time with his wife and daughter; woodworking; puzzles. Favorite Thing About Lawndale: Her coworkers and getting to help our clients and their pets. What Her Teammates Say: Jamina is like a calm breath of fresh air! Always dependable, she is a true joy to work with and she has a constant supply of positive energy. Her great sense of humor and beautiful smile lift everyone up around her. She is so kind, generous, caring, and encouraging – to co-workers as well as pet owners. She also loves to dance and has great fashion sense! Hobbies: Spending time with her pets; walking in the park with her husband and her dog; spending time with family. Favorite Thing About Lawndale: Working with her coworkers and getting to see all the pets that come to the hospital. 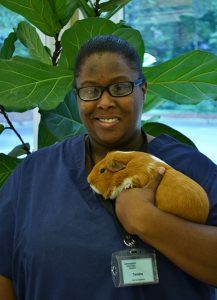 Educational Experience: ​Elizabeth is currently enrolled in the Penn Foster program to become a veterinary technician. What Her Teammates Say: Elizabeth is cheerful and ready to lend a hand with whatever is needed around the hospital. Elizabeth goes out of her way to make sure there is enough help for any given situation, and she will drop what she is doing whenever she is able to contribute to the needs of the team. We love how she has a big smile for everyone, an eagerness to learn, a friendly attitude, and a clever personality. She has a genuine love of animals that shines through in the way she performs her job. She always persists and goes the extra mile without any complaints! Hobbies: Hanging out with family and friends; Going to the movies. Educational Experience: ​Angie is currently in her senior year of nursing school. What Her Teammates Say: Angie is am extremely capable and hard working member of our technical team. She has a remarkable combination of technical skill, broad knowledge of the field, and a willingness to jump in and help whenever she detects a need. She also has a great sense of humor and is able to diffuse potentially stressful situations with her calm demeanor and her quick and witty comments. An independent self-starter, she sets goals and works steadily towards them, and she takes setbacks in stride. She is determined, reliable, trustworthy, and strong. 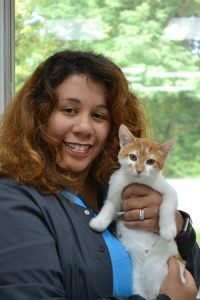 She has an incredible knack for efficiently drawing blood from animals, and she is definitely a resident cat whisperer. 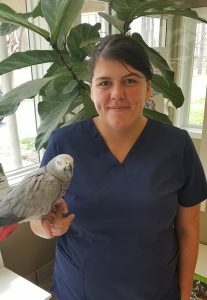 Angie’s compassion and care extends to all animal species…and she is even working on her nursing degree! 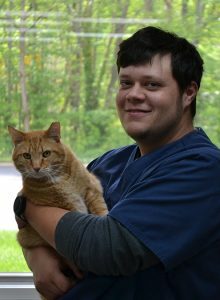 Educational Experiences: ​August is currently in the veterinary technician program online through Penn Foster. She hopes to become a zoo veterinary technician. What Her Teammates Say: August really cares about the animals (corgis especially!). She is a very organized, motivated, and reliable employee who always pays attention to the details. She never complains and always gets her tasks accomplished on time. She is also very artistic! What Her Teammates Say: Robin is a very positive individual, and she pays attention to the details in everything she does. She has a great sense of humor, and she always wears a smile on her face. Robin is incredibly helpful, and she has a knack for teaching and directing others in an encouraging manner.